Fall seems to be becoming everyone's favorite season. My family loves it too! Each year I find out about new activities and fun festive places to take the kids during October. 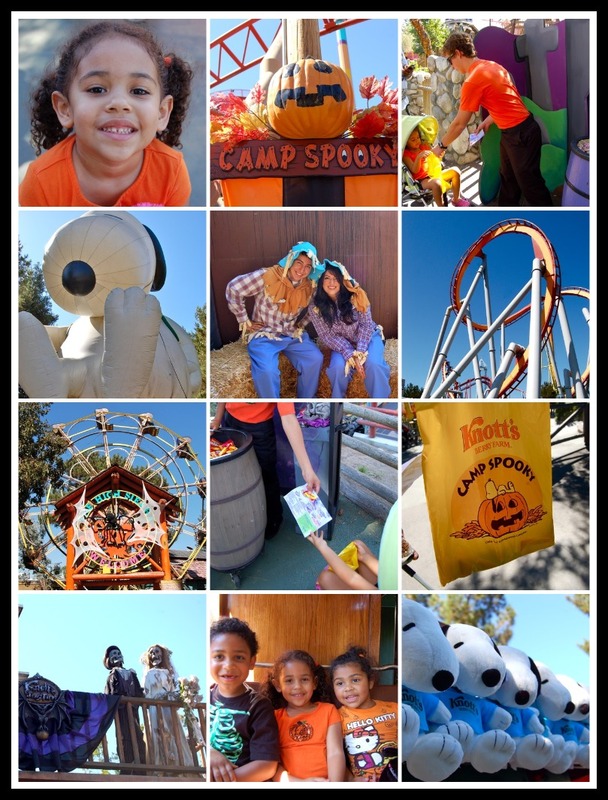 Last weekend we went to Knott's Berry Farm (America's first theme park - Ahem) and had a family fun day! It's been years since I had been there, like the last time I was there I was in High School at a Cheerleading Competition. (Yeah I know, another decade ago.) Kaia had never been, so it was a real treat for my husband and I to experience this with her. Well, we all know about Knott's Scary Farm because it's become so popular over the years. And now that my older kids are all in High School they love doing crazy scary stuff like that. (I remember being that young once.) But what you may not know is that they have a non scary celebration too just perfect for the younger crowd. Camp Snoopy gets a Halloween makeover, during the month of October it becomes Camp Spooky. A great place for families with kids from ages 3-11 to enjoy all sorts of Halloween activities. My 4 year old daughter enjoyed shows, crafts, a Monster Dance Party, and Snoopy's Costume Parade too. Kids are encouraged to dress up in costume (not mandatory) because they also get to trick-or-treat which is always a big hit with my little one. The good news is that all of this holiday fun is included with regular park admission. For more info be sure to visit the Knott's website. Full Disclosure: I was not paid for this post. I was invited to a Family media event and had a spooktacular time. Thank you Snoopy for having us. These opinions are 100% mine and 100% fresh.